Just the other day I became part of a revolving email thread with a bunch of my fellow cycling instructors for the gym that I coach at. I say cycling because the group that I work for was recently acquired by LA Fitness and they're affiliated with Keiser versus Mad Dogg Athletics Spinning®. Prior to the acquisition we were all Spinning® certified, since then it appears that pretty much any certification is acceptable. This is not a knock on Keiser, or any other brand for that matter, I just bring it up to point out that we have a variety of credentials at work here. Elaborating even more, there seems to be a lot of indians and not enough chiefs, if you get my meaning. No consistency and/or accountability. I haven't determined if this is an LA Fitness characteristic or just a general disarray as the group I am working with becomes assimilated. So on to the email thread. Apparently at least one of my fellow instructors had been having his participants pedal backwards. That was brought to the attention of on of the other instructors who blasted out an email saying that we should not be doing this because it is contraindicative and that according to one of Spinning® Master Instructors, incorrectly loads the knee joint applying pressure at a position that the knee isn't equipped to handle it. At least one instructor that was coaching this acknowledged that he was guilty of this instruction but justified it in that it was to prevent the participants from plateauing in their workout. Hats off to him for admitting that he was the source. Apparently Les Mills RPM at one time included pedaling backwards as part of their program. I'm not sure if this is still true so any feedback would be great. Keep in mind that they are going for knee flexure not muscle strength so they are using very light resistance. 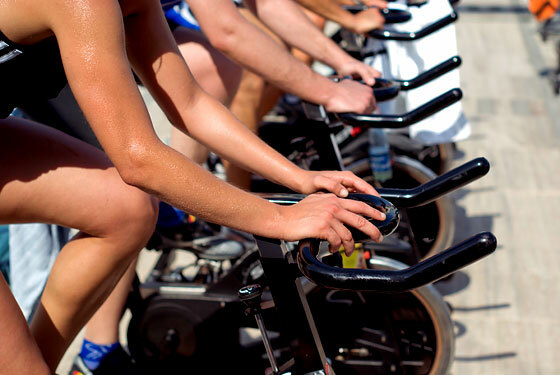 Personal trainers will often instruct there clients to pedal backwards. What this means to me is that they have no formal training on a bike but they will make the same argument about avoid a plateau. Most PT's I know are very good on the resistance side of things, but not so much on cardio conditioning. When using an elliptical machine it's very common to "pedal" backwards because it results in a different muscle recruitment. 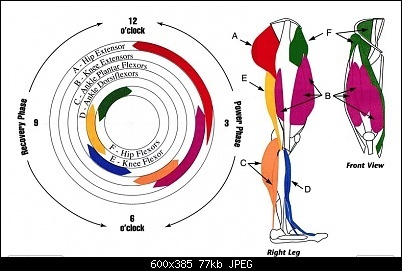 Forward pedaling uses the biceps femoris, part of the hamstring muscle group. 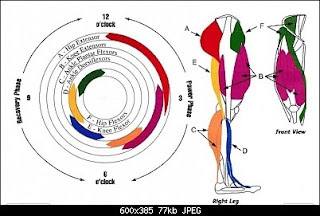 Backward pedaling works the rectus femoris, part of the quadricep group. Note that on an elliptical your pedal's won't unthread by going in this direction. Build any speed on a fly-wheel weighted bike common in indoor cycling rooms and you run the risk of having your leg be pulled into hyper-extension. Think of having a machine pull your knee to a locked position - Ouch! If you wouldn't do it on a real bike you shouldn't do it here, and unlike a real bike a Spinning® type bike usually pushes back so keep that in mind. 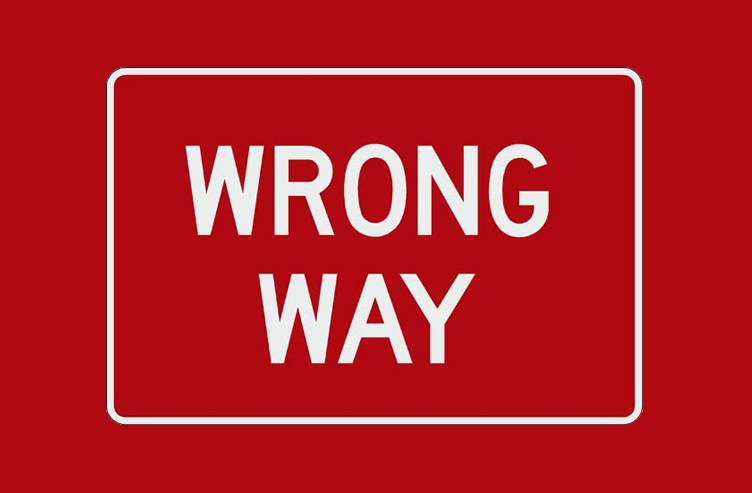 If you need to come up with a new technique, position, or instruction to keep your students either engaged or from plateauing then you're not doing your job. Remind them there are other classes they can augment their workout with to prevent the plateau (yes we all know that Spinning® is the best). And if they're bored with what you're doing then it's either your method of instructing or it's them. You can't fix them, change your instruction to coaching and tell them why they're doing each thing and help them establish some goals and a plan.